In the first-half of 2014 alone US corporations bought back more than half a trillion dollars worth of their own shares. Stock markets these days are not, in general, a place for a companies to raise new capital for growth; they are, more often than not, a handy way of extracting cash from them. The strong empirical relationship of corporate cash flow and borrowing to productive corporate investment has disappeared in the last 30 years and has been replaced with corporate funds and shareholder payouts. Whereas firms once borrowed to invest and improve their long-term performance, they now borrow to enrich their investors in the short-run. It’s an issue close to the Institute’s heart; “We are living in perilous times: The Great Recession and continued economic stagnation; radical inequality that is destroying the middle class…” opens their web page on their ‘New Deal for the 21st Century‘. The numbers are startling. In the 1970’s an additional dollar of earnings or borrowing led to around 40 cents of additional investment; today it’s around 10 cents. Payouts to shareholders of corporations in aggregate are greater than their total investment. In fact, amongst corporations there is a strong correlation between additional leverage, debt, and shareholder payouts. The report’s author, Institute Fellow JW Mason, largely blames the shift from the managerial model that dominated corporations in the seventies and eighties, when cash flow financed investment, to a system of shareholder primacy where cash flow, and particularly leverage, finances accelerated dividends and share buybacks; “This change in corporate finance associated with the ‘shareholder revolution’ means there is good reason to believe that the real economy benefits less from the easier credit provided by macroeconomic policy than it once did“, he says. The subtlety here is in where one lays the blame. Mason is clear that it’s the relationship between the equity shareholder and the corporation that’s at the root of the problem; “In the new rentier-dominated model, more money coming in means more money flowing out to shareholders“. His analysis of this issue is the deepest I have seen and his argument that the shift in finance is down to the changing power relationship between shareholders and managers, which has swung firmly back to the former, is compelling. We need, however, to make or we don’t hang the wrong guy – or, technically speaking, hang the wrong contract. The shift in corporate governance is real but the relentless rise in the availability of debt has had a much greater impact. Like many, the report takes cheap credit as a given rather than seeing it as the biggest problem. To be clear, modern corporations are riddled with principle-agent problems but these, more often than not, are accentuated by the availability of cheap debt. It is the availability of overly cheap credit, especially since the crisis but in reality since the breakdown of the Bretton Woods Agreement in 1971, that facilitates their changing approach. 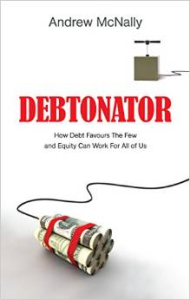 It is the proliferation of debt that is largely responsible for the corruption of the equity contract, with a serious impact on the real economy; fixed investment remains well below historical averages in the US, four years after the official recovery began. The power of shareholders and the drive to extract cash from corporations has gone too far. The incentives that took us to this point, however, are not inherent in the equity contract per se. It is the incentive that comes from widely available, and overly cheap, credit that has brought us here.